Fans will know Lea Michele and Darren Criss from their hit show Glee, their solo singer/songwriter careers, and their illustrious Broadway ventures. Criss is fresh off an Emmy win for his performance in American Crime Story: the Assassination of Gianni Versace, and was just named one of Entertainment Weekly’s 2018 Entertainers of the Year. 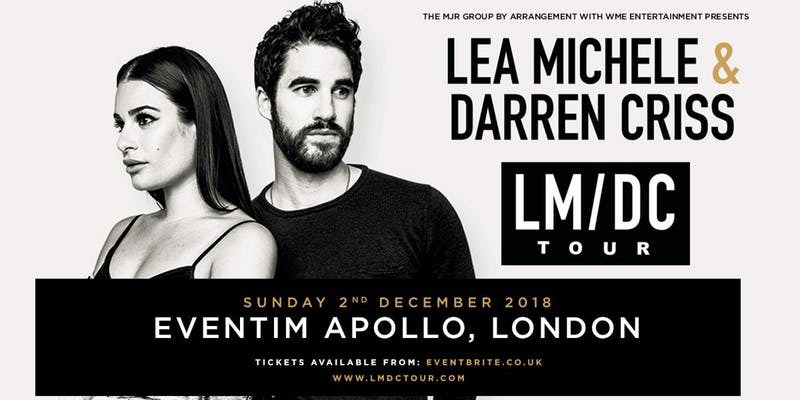 On Sunday night, the Hammersmith Apollo was treated to an electric evening as Lea Michele and Darren Criss played to a sold-out crowd, bringing the audience to their feet on several occasions. This energy could be felt all the way to the back of the room, where some were dancing throughout the night. The concert allowed both artists to shine in solo sets. Michele roused the crowd with several Glee classics and tackled some songs like Lady Gaga’s ‘Edge of Glory,’ demonstrating her incredibly impressive vocals and allowing for more intimate moments with the audience, which was furthered by her confessions to the audience about her stage fright and her relationships. Criss did the same, sharing his experience as a songwriter with the crowd, as well as showing off his gorgeous, buttery vocals. He also talked about how he endeavoured to make every show unique to the city, featuring a song written by a musician from the area (in our case, it was Keane’s ‘Somewhere Only We Know’). Criss’ enthusiasm for his career was infectious, and his appreciation for music is sure to galvanise anyone at the shows. It was when the pair sang together that they shone the most, performing beautiful folksy renditions of ‘Falling Slowly’ and ‘Getaway Car,’ as well as crowd-pleasing versions of ‘Suddenly Seymour’ and ‘Don’t you Want Me.’ The banter between the two was also delightful, their friendship shining through as they challenged each other musically, creating exciting moments of improvisation. At one point, Michele prompted a spontaneous sing-along to the iconic Glee versionof ‘Don’t Stop Believin;’ a special moment for any fans in the audience. Overall the night had something for everyone: Gleeks, fans of the two’s singing careers, musical theatre fans, Starkid fans, and fans of music and performance in general. The soaring voices of Michele and Criss were spectacular, and would win over even the most reluctant tag-along. The duo masterfully led the crowd through a diverse mix of numbers, allowing the show to feel somehow like an intimate folksy gig, a Broadway variety show and a lively concert all at once.